Accepted Scientific Name: Tephrocactus aoracanthus (Lem.) Lem. Origin and Habitat: Argentina, San Juan (Los Flores, Tudcum, Chicaguala of Lomitas, Pachaco, Thermas La Laja, Behind Huaco, La Rinconada, altitude 700 to 2200 m), La Rioja (Behind Guandacol, Las Tucumanensas, Tres Cerros, altitude 1100 to 1400 m), Mendoza (Las Heras, Lujande Cuyo, altitude 700 to 1200 m) and Catamarca. Altitude: 400 to 2200 meters. Habitat: It grow on high-plains in different environments both in open areas and under shrubs. 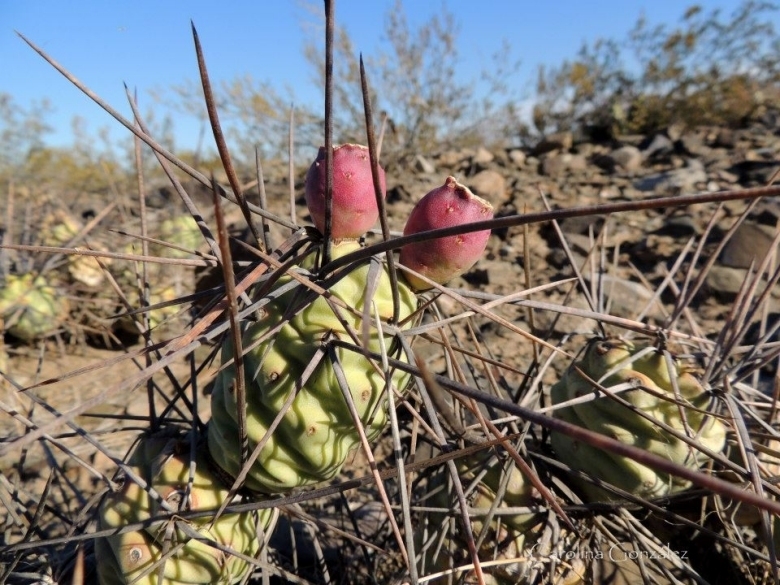 The variability in light and temperature under shrubs generally has no influence on the distribution of Tephrocactus aoracanthus. 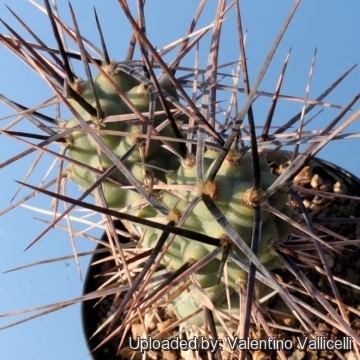 Apparently, this cactus has great ability to adapt to different conditions of both photosynthetically active radiation and temperature. Tephrocactus aoracanthus has a wide distribution, is locally abundant, is present within protected areas and is not affected by any threat. 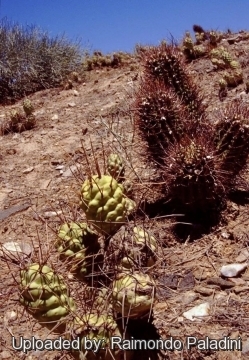 Tephrocactus aoracanthus var. paediophilus (A.Cast.) J.G.Lamb. 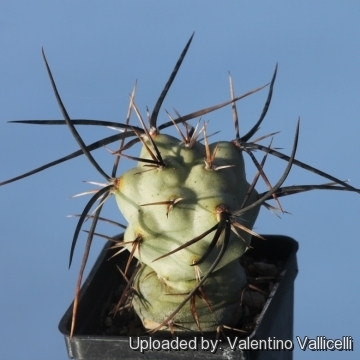 Tephrocactus ovatus (Gill. ex Loudon) F.Ritter non Backeb. 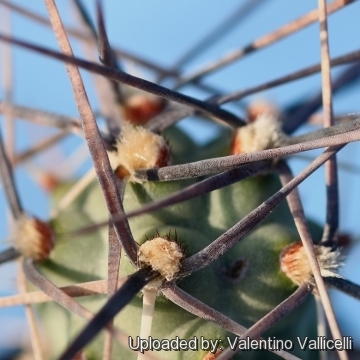 Description: Tephrocactus aoracanthus is one of the most hazardous species with fierce, wonderful spines. 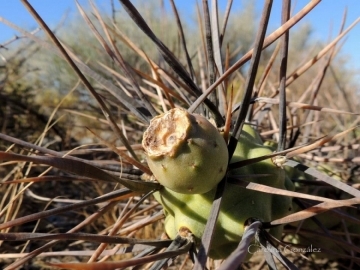 The spines are very stiff and stick out to every thing that enter in contact with them, this way the stems segment spread around in the environment. Habit: Plants erect that will form clumps with some branching with age, 30-100 cm high and 1-3 metres in diameter, but usually couldn’t get very tall as segment kept falling apart. Stem segments: Somewhat fragile (easily detached), ellipsoidal to ovoid, prominently tuberculate, 5-10 cm long and 4-8 cm in diameter, of a very characteristic pale grey or greys-green colour. Tubercles: Moderately to strongly defined, forming a network of more or less regular spiralling lozenge in the epidermis. Areoles: Small on top of a conical protuberance, as many as 60 per segment (but usually about 30) extending to the base. The basal areoles are spineless 2-3 mm in diameter, while the areolae in the upper two thirds of the segments are significantly larger (up to 6mm) and bear spines. The new areoles at first are filled with white hyaline wool (rarely brown at the the centre). In the centre of the areola there are stiff, yellowish brown glochids up to 5 mm long. Flowers: Large, white to light pink, 4-6 cm long by 5-8 cm in diameter; tepals broadly spatulate with a hard and brown mucro; pericarpels inverted cone-shaped up to 3 cm long and 2 cm in diameter, with many glochids and sometimes with spines up to 15 mm long on rims at the top of the pericarpel. The stamens are sensitive; filaments white; anthers yellow; style clavate white with up to 8 stigma lobes. Fruits: Spherical to oval, up to 3 cm in diameter dehiscing irregularly, sometimes with persistent spines. 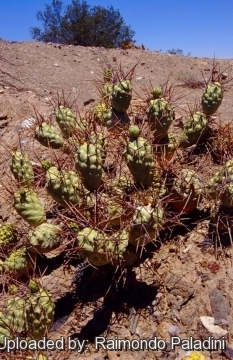 Tephrocactus aoracanthus var. paediophilus (A.Cast.) J.G.Lamb. : has very long spines (as much as 30 cm long), papery but still sharp. Distribution: Argentina (La Rioja and Mendoza). 4) Méndez, E., Kiesling, R. & Ortega-Baes, P. 2013. 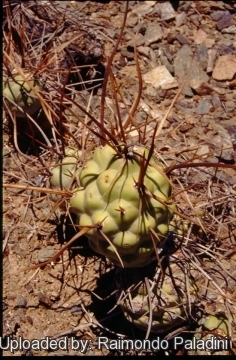 Tephrocactus aoracanthus. The IUCN Red List of Threatened Species. Version 2014.3. <www.iucnredlist.org>. Downloaded on 12 April 2015. Cultivation and Propagation: It is easy to grow. The main growing period is spring. It might produce some new segments in the autumn too. Hardiness: It is fairly cold resistant and hardy to -9°C depending on the clone. Soil requirements: It needs a very draining mineral substrate. Water needs: Watering during the active growing season (spring and summer); this will encourage steady growt. But be careful with watering (rot sensitive). Keep dry during the winter rest. Fertilization: Fertilize moderately during the growing seson with diluted high potassium fertilizer. Propagation: Cuttings, or occasionally seeds. It suckers profusely and is very easy to grow by just knocking off one of the 'cones' and stuffing it in the ground. Warning Handle with care! 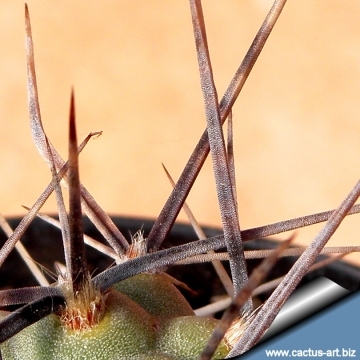 The little glochids at the base of these larger spines are quite a nuisance and the minimal touch may be fatal. It is best to use gloves to handle this plant.